I can state with absolute certainty that on June 29th 2012, I spent six hours and thirty-five minutes being creative and crafty. The following day, the 30th, I spent an insane 10 hours and 40 minutes at the same activity! Sadly, that day I only spent one minute exercising. I also know that from June 1st to July 8th I spent an average of three hours and three minutes in the kitchen daily. How do I know these things? And why does anyone care? For the past ninety days I have logged everything I've done. Each morning since June 1st 2012 I have calculated how much time I spent doing each of the above ten categories on the previous day. The first benefit of this log became evident after just a few days. Each morning I was filled with a sense of accomplishment as I totaled up how much time I spent doing each activity yesterday. This was especially pronounced the morning after a productive day. I would look and say, "I spent a lot of time doing things that are good for me! Awesome!" This overwhelming sense of my actions having a real "impact" flooded me even in the first two weeks of June. Logging my activities has given me a sense of reality like nothing I've ever done before. Things got exciting when I started adding up the totals for periods of time and calculating the average amount of time spent on an activity per day over a certain span of time. From July 22nd to August 3rd I spent 2 hours and 21 minutes on my business daily (on average) and 32 minutes on facebook/e-mail/pinterest daily (on average). From June 1st to June 13th I spent an average of 40 minutes daily on my personal education through documentaries, informational articles and educational books. From June 1st to June 13th I spent an average of 23 minutes daily on my garden, as I was still needing to tend baby plants and look after them. Yet from July 9th to August 3rd I only spent an average of 2 minutes a day in the garden, as that was all that was needed to cut out an over-sized weed and harvest tomatoes, zucchinis, broccoli, blackberries, etc. The above snippets are interesting, but they don't say much about my overall trends. Sure, some days I spent a whopping five hours playing video games. Some days I spent seven hours in the kitchen. Some days I spent eleven hours being artistic! Some days I spent over four hours cleaning. The distribution of my activities is wild. I get into something and I roll with it. When I was busy working on writing the HTML for this website I spent over six hours a day working on the project for three days in a row. These snippets of time can actually be a bit horrifying. I find myself asking questions like: "How could I have spent so little time on my education and so little time exercising, but so much time drawing and gaming?" Or, "What on earth am I doing in the kitchen for so many hours in a day?" Or, "I haven't done any gaming or anything artsy for more than minutes in weeks. I'm working myself to death!" But once I'd averaged enough time together, I found the results soothing. Everything balances out. In hard factual numbers I have proof that I'm actually balancing my time pretty well. Or at least, I've balanced my time well for the past ninety days. How much has logging my time changed how I spend my time? I have no way to tell for certain, but I'm quite sure it has improved my habits. I want to be able to look at those numbers telling me that I'm exercising often, that I'm educating myself consistently, and so on. I don't want those numbers to be a bunch of zeros. That would make it seem like I wasn't doing anything. The implications here are enormous. What if I had decided to track ten different categories than I did? What if I tracked Grooming, Time Talking to Husband, Time Being Charitably Nice, Time Spent Meditating, etc? Would I then lean towards those activities because I wanted to see big numbers in hours and minutes tracking those things? I think that the categories I have chosen have absolutely impacted the way I think about what I do, and what I do. The impact is strong enough that each day I feel a twinge of guilt about not spending more time in my garden. However, for the most part, I'm very pleased with how my 90-day averages turned out. Before commenting about what the above averages imply about me, I want to first mention some of the things that are not shown in the above numbers. I sleep about eight hours at night (not calculated, this is my educated guess), so I'm awake 16 hours a day. The above averages cover 9 hours and 51 minutes out of the day. That means that 6 hours and 9 minutes per day are spent doing things not on the list. There may be other things as well. Unique events can't all be listed, certainly. You may find it interesting to note that two years later, in August 2013, I'm still logging everything. I have actually logged things like grooming for a period of time, and after writing this post I started tracking my sleep. This has been a very beneficial practice for me. One thing I notice is that I spend a lot of time coming up with useful tips, tricks and ideas for you. I like helping out. I do it naturally. I enjoy helping my clients move from unwell to well. I love buying organic cotton and turning it into clothing. 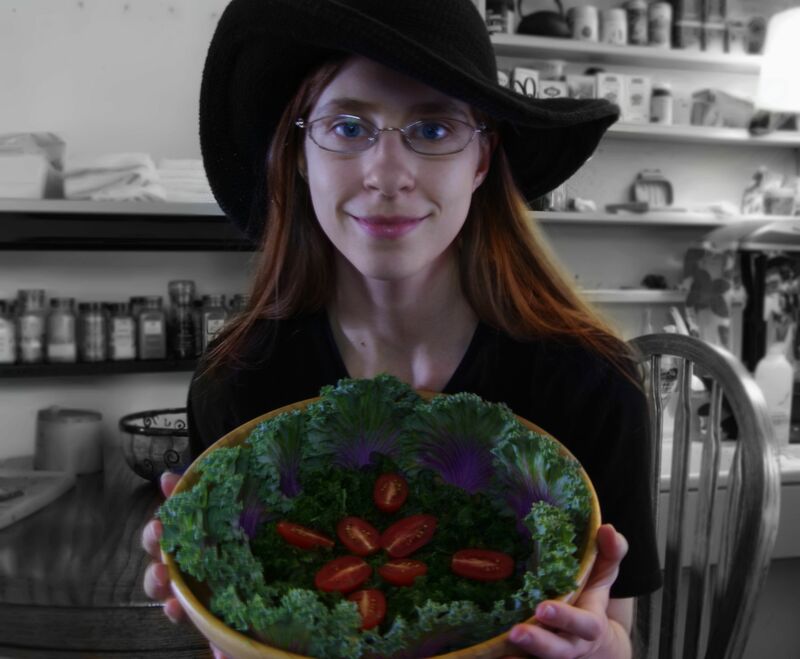 I love to create gourmet raw foods, photograph them, share with friends, and give you the recipe. I do this all without charging anything for it because I believe in freedom of education, freedom of knowledge and freedom of life itself. But, if you feel inspired, please send me a few dollars. I'm so busy learning new things and being good to the planet that I often forget to make any money. This is perhaps the number of most concern to me, and why I have it listed first in my charts. Working on meal plans, writing recipes, photographing food, helping clients, promoting myself, working on my website, writing blog entries, calculating nutrition in various foods in comparison to others, catering events, and goodness the list goes on. These things are my life force. They are the things I do that make me feel accomplished and give me a "place" in the world. This category is obviously important for the aspect of producing a profit, but also because it is the category where I connect with others in a meaningful way. Bringing joy and healing to another human being is a foundation of a happy existence. I'm pleased to say that I've spent a lot more time on things in this category in August than I have in either June or July and I expect the trend to continue. In the last thirteen days I've averages two hours and forty minutes per day. I have a love-hate relationship with how much time falls into this category. On the one hand, I don't use a phone. I use e-mail, and that is bound to take up a certain amount of time due to necessity. I must communicate with others about plans, if nothing else. For example, I can't just show up somewhere without telling anyone I'm coming. There is a minimal amount of correspondence that must happen. What I don't like is when I get "caught up" looking in to random things on facebook or pinterest for two hours at a time. Afterwards I know a little bit of trivia and I've had a few laughs, but... Ultimately, I don't feel like I've accomplished anything and that doesn't feel so good. Also, I don't find it inspiring. I could spend that same two hours watching a single motivating documentary and come out of it feeling really educated and inspired. I have another difficulty with this category, as to what comes under "business" as a form of promotion, and what comes under "social media" as me just being social. If I spend thirty minutes on twitter and a few links led to my website, is it really justified to count that as thirty minutes spent doing "business"? It doesn't seem like it should be, and so I end up splitting it into 20 minutes for social media and 10 minutes for business. That is fair, I think, but is it accurate? This category is another that I have a love-hate relationship with. I enjoy video games immensely for a time, but then I start playing because... I feel like I have to? Or something else silly. There becomes a drive to "finish" the game just to finish it (even though I rarely ever finish any video game). There becomes this need to stay "in" to it. I quickly become an addict to a game – dreaming about it, thinking about it, wanting to play it all the time – and just as rapidly I lose interest. While I'm in the "addict" phase I'm terrified of losing the addiction and not finishing the game. While I'm in the "no interest" phase I have little to no inclination to play any video games at all. I've tried to find middle ground with this for years, but have not. I seem to play games ravenously for a few months and then stop entirely for a few months. When it comes to board games, I have a love relationship. Board games are one of the most wonderful ways to socialize. I feel more accomplished when a play a board game because of the "reality" of playing with live players in the same room. It doesn't have that draining addicting effect on me. Sometimes I really want to play board games more, but it's not that same obsessive feeling I get with video games. As a side note, some of my favorite video games: Civilization (I own all of them, including Test of Time, Call to Power, Warlock, Colonization, Alpha Centari, etc), Pharaoh (one of the only games I've ever finished), Plants versus Zombies, Defense Grid, Eufloria, Grand Ages: Rome and Sanctum. Some of my favorite board games: Race for the Galaxy, Taluva, Diplomacy, Conquest, Blockus, Cranium, Settlers of Catan, Dominion, Ra, For Sale, and Saboteur. I have a love-love-love relationship with leisure reading. I read to cool down from anything and everything. Stressed out? Read. Tired? Read. Need a break? Read! I especially love the type of fantasy written by Steven Brust, Karen Miller (also known as K. E. Mills), Jo Graham, Carol Berg and Terry Pratchet. I also enjoy historical novels in some cases, such as Jean Auel's Earth Children's series and all of Joan Grant's books (which aren't actually in the fantasy genre at all). While I love "educational reading" as well, it doesn't give me a rest, it gives me a boost of information. Stories let my mind relax. Information lights a fire under me, which may result in ideas or action. This is the most consistent category of all. I always eat, every day, without fail. The lowest average (of a 13 day segment) for this was two hours and thirty-eight minutes. The shortest day of all was an hour (that is probably the minimal time for eating itself), and that was because Jay brought me my meals that day. The longest daily average (of a 13 day segment) was three hours and thirty-two minutes. The only other category that was almost as consistent was reading. It makes sense: fuel for my imagination and fuel for my body. These things I must have consistently. If only I could apply this same sort of mindless "need" to exercise habits! Do I spend more time in the kitchen as a raw vegan than most people do? Probably not. Much of the time I grab two oranges, wash them, peel them, eat them, wash my hands and I'm done. That takes me six minutes (I happen to know this for a fact). Other times I make a nori wrap. Nori wraps take me about thirteen minutes to make, eat and clean up after. I usually have two at once. It doesn't take much more time to make a second or third one at the same time since most of the time spent is taking things out of the fridge and putting them back again. Sometimes Jay and I make a carrot juice. That involves washing the carrots, putting them in the juicer, drinking the juice and washing the juicer. We usually do this together and it takes about twenty minutes for us each to have a tall glass, or forty minutes if we make an entire pitcher full. Most of the effort expended in making carrot juice is in washing the carrots. It's a great deal though since organic carrots generally cost $1 a pound. Name another organic vegetable that is only $1 a pound! If you're interested, click here for my juice recipes. Kitchen time is really three different processes: Preparing, Chewing & Cleaning. I think the time that each of these takes is fairly balanced. With some foods you're lucky and clean up and preparation takes less time than chewing (like with nori wraps). Most foods however take just as long to prepare and clean up after as they do to chew. In the case of the smoothie, you're doing more swishing in the mouth than chewing, and it doesn't take long, so clean up and preparation really do each take as much time as the drinking of your glass of deliciousness. In the case of a smoothie, the entire process (rinsing the blender, taking everything out, blending, drinking, cleaning up afterwards) takes me about twenty minutes to serve two people. I do quite a bit of cleaning in the kitchen every single day. I don't like dirty dishes left about, or dirty kitchen towels sitting around on counters. These things are big no-nos with me. So most of my cleaning is already included in the "Kitchen" category. I go entire days without cleaning anything else. Clothes come off me and go directly onto a hook or into the laundry. That takes seconds and is hardly worth logging. I didn't log hygiene activities like brushing my teeth or hair, so that wouldn't go here either. What is logged in cleaning are these activities: sweeping, mopping, dusting, organizing, laundry washing and folding, and home-improvement sorts of tasks that aren't artistic. One day where I logged five hours on to cleaning I spent much of the day taking apart cardboard boxes and stuffing them in the recycling bin and masking a room to be painted. I also took boxes of stuff out to the porch to be donated that day, as well as doing a lot of sweeping, dusting and reorganizing. I rarely spend 27 minutes in a day cleaning. Most days are either five or ten minutes spent dusting one or two things or folding some laundry, and then once or twice a week I spend several hours working on cleaning and organizing some particular area. This I find a little shameful. This includes walking! Goodness, isn't it a life-saver that I've become so particular and discerning about food!? What's shocking about this tiny, tiny amount of exercise is that I'm still slowly getting stronger. Can anybody say: raw foods are powerful? Of course, I'm also on my feet the majority of the time I'm in the kitchen, cleaning and gardening. However, twenty minutes of cleaning rarely gets me as out of breath as does twenty minutes of exercise. Being artistic is intrinsic to being me. Without being creative I rapidly feel smothered and unhappy. Almost everything I do is feeding my imagination or an expression of creativity. There are some things I enjoy doing that are not creative (such as figuring out what foods can be matched up for optimal nutrition) but most activities I enjoy are very creative. This category includes both drawing done for pay (art commissions) as well as art done for fun (leisure art) as well as practical art (home improvement). Much of the 75 hours were spent on a project of wall-papering my room with artwork. I started with printing out almost all of my artwork that I had scanned in black and white and then applied a mixture of glue and water to the paper and then carefully flattened the papers onto the wall. The project has expanded outside of my own art since I've put up around 1000 sheets of paper at this point. I never realized when I began how many sheets of paper it would take to cover the entire room. However, the result is stunning. I'll have to write a separate blog about it some time. This is a bit shockingly low. Only six minutes a day, and yet we've harvested bowls and bowls and bowls full of lettuce and leafy greens. We've brought in handfuls of pea pods, bowls of tomatoes, handfuls of blackberries, and nice bunches of mint, parsley, chives, sage, thyme and other herbs. We've had zucchinis as well. Despite the tremendous amount of lettuce, chard, arugula, broccoli, leeks, etc, that we've brought in, we've had to little work on the garden since our initial spring planting. I wrote about this in more detail in yesterday's blog entry. I find this interesting. Just 25 minutes a day, and yet I've learned so much in the past 90 days. I've learned about cob construction, read a book on iridology, read half of the book Think and Grow Rich, read most of Mimi Kirk's book Live Raw, read numerous articles on health, nutrition, HTML, blogging, spirituality, and more. I've watched around a dozen informational videos. I've also listened to a lot of Question & Answer sessions on a number of topics that are a part of The Vegetarian Health Institute's vegetarian/vegan course. They've done topics like "Why is gluten addictive?" and "Is Qi Gong actually effective?" and "How to build bone density." While I prefer reading to listening generally, it is nice sometimes to just lay down and listen, giving my eyes a rest. And yet, all that boils down to an average of 25 minutes a day. Incredible. No wonder they say you can be a world-wide authority on a given topic if you read about it for an hour a day. That's a monumental amount of information to take in. If you can retain it all, you're a genius. And so this is what has been for ninety days. But as a wise woman said in the documentary "The Secret" – if you only look at what is, you'll get more of what is. You must contemplate what you want, and focus on it. You won't get where you want to get to if you just keep looking down at the ground you're standing on. You must look at the horizon and move towards it, only glancing at your feet enough to keep from tripping. My Raw Business | Current: 1 hour, 31 minutes | Goal: 2-3 hours | I'm can do more. Social Media | Current: 52 minutes | Goal: 40 minutes | I'm happy where I'm at. Gaming | Current: 51 minutes | Goal: 50-60 minutes | I'm happy where I'm at. Leisure Reading | Current: 1 hour, 42 minutes | Goal: 1-2 hours | I'm happy where I'm at. Kitchen | Current: 2 hours, 54 minutes | Goal: 3 hours | I'm happy where I'm at. Cleaning | Current: 27 minutes | Goal: 30 minutes | I think I could clean a bit more. Exercise | Current: 13 minutes | Goal: 40-60 minutes | I can do a lot better! Art | Current: 50 minutes | Goal: 40-60 minutes | I'm happy where I'm at. Gardening | Current: 6 minutes | Goal: 15 minutes | I could stand to enjoy my garden more. Education | Current: 25 minutes | Goal: 35 minutes | I could learn a little faster. I guess, mostly, I'm pretty happy with where I am. Mainly I want to exercise more. If you haven't already asked yourself this, you're going to face-palm yourself when you start wondering... How much time did I spend calculating all this? Not as much time as you'd think. I didn't specially check to see how much time it took. It'd be strange to have an eleventh category called "time spent logging and calculating things I do" but I suppose I could have done it. I do have on my activity log here and there an entry that reads, "Calculating Averages" which I did every thirteen days. During the day, I'd estimate the logging and totaling took about twenty minutes total per day with the addition of twenty minutes spent every thirteen days to total up and calculate averages for that time period. In the future, I plan to keep logging, but I'm not going to do the thirteen day totals and averages. Instead, I'll only do that every thirty days. That'll save me around forty minutes a month. I am also going to start logging more categories, including spiritual related activities. I am dividing my time spent on my business in to three categories: Content Creations & Editing, Promotion & Everything Else. I figure it is pretty important to know these things. Also, for my future logging, I've changed the order in which the columns are in. I've moved Gaming to the end, for example, because it is not priority in my life. And, two more categories I've added: Time spent sleeping (because this might be very useful to know in terms of health) and Time spent calculating totals and averages or doing anything related to logging my activities. I just couldn't resist adding that last one. Ultimately, it'll make the process take a little bit longer, but I'd like to know how much time I'm trading to understand how I'm spending my time. It is kind of like keeping track of how much money you pay your accountant to understand your finances. It is worth knowing. Ultimately, I think I've learned a tremendous amount about time and how I spend it. I feel the entire experiment has been well worth it on all bases. I feel that I have actually gained time by spending the time to do this. It is very much like the time I've gained by being healthy even though I've had to invest a lot of time in to my health. It's as that one quote goes, "Spend an hour a day exercising or spend twenty-four hours a day being fat." I don't agree with what the quote is saying about exercise (as I only exercise about 13 minutes a day and I'm not fat! ), but I do agree with the principle. Spend a few hours eating well, exercising, thinking positive and you get to have a great life. The alternative is spending all your time having a bad life. What this all boils down to, is that we are what we spend our time on. What we do makes us. In a way, these averages I've listed tell who I've been for ninety days. Aren't you dying to learn who you are? Get logging!